For my hoildays I went camping at Waikawau Bay with my family and many others. Waikawau Bay is in the Coromandel four hours away from Auckland. I did some musselling with my family and friends. We caught many mussels! Last year my cousin Holly who is normally at camp with us was away in France, on an exchange. We had other people come to camp. Thier names are Milly ,Heidi and Max Stewart. Awesome! Keeley did you eat the mussels? Yes we did we have a friend named Steve cooks them on his BBQ. That Sounds like a great holiday Keeley. How long were you there for? We were gone for a week we REALLY! enjoyed ourselves! 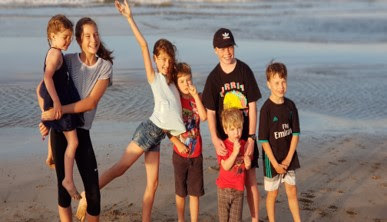 What a wonderful family holiday Keeley! I used to go camping with my family every holidays when I was your age too! Lots of good memories. Yes it was a lot of fun we went to Waikawau Were did you go?